Parents are rightly concerned. Children with ankle and foot problems often have to wear orthopaedic devices for prolonged periods. Inappropriate or badly fitting socks can seriously undermine treatment. Discomfort, sores or even blisters can be distressing for children and can lead to resistance of AFO’s and even periods when they cannot be worn. Socks used with AFO’s should be good quality, well-fitting to avoid creases and should not have seams where they can cause irritation. The socks should be moisture wicking and have sufficient leg length to extend beyond the AFO’s. The best protection against blisters and sores are our Black Robin socks. 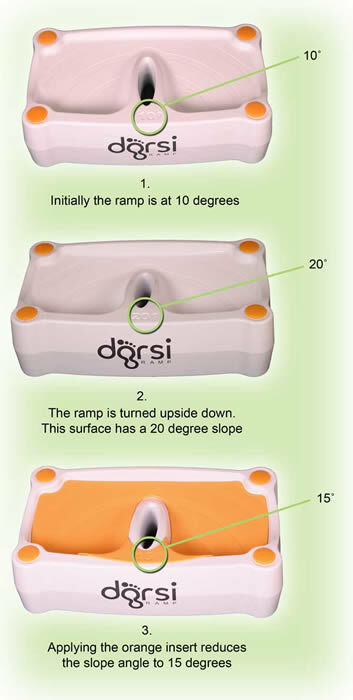 Dorsi Ramp is easy to use. However, if in doubt about any detail of its use please contact C-Pro Direct Ltd for advice and we will send a copy of our User Guide to you. If in doubt about the applicability of using Dorsi Ramp please consult a qualified medical practitioner with knowledge of the user’s condition. Always avoid using ramp angles that cause discomfort to the child. Excessive stretching can lead to calf and tendon strains or tears. Dorsi Ramp can be used as and when required for as little as one minute or for tens of minutes at a time. The greatest improvements in dorsiflexion will be achieved with frequent and regular (daily) use – even for relatively short periods of time. Persuading young children to engage in regular physiotherapy is not easy. Experience with Dorsi Ramp has shown that it is best to incorporate its use into everyday activities and to create incentives and positive associations with its use. Conversely, try to avoid situations that lead to negative associations as these will lead to resistance. The best examples of use are when the child is so distracted by what they are doing that they become unaware they are undergoing physiotherapy. Here are just a few examples of how the use of Dorsi Ramp can be incorporated into everyday activities. Daily Teeth Cleaning: Dorsi Ramp can be placed in front of the bathroom sink and used during the morning and evening teeth cleaning routine. Dorsi Ramp acts as a step which helps young children reach the sink. The designer of Dorsi Ramp has a kitchen timer and insists on two minutes teeth cleaning morning and evening using the ramp. The routine is easy to maintain and rewards can be established for compliance. Computer Games: Many parents and carers struggle to regulate use of computer games. It is easy to say, “OK another 10 minutes, but providing you stand on the ramp”. The distraction and incentives here are obvious. Kitchen worktops: Children love to help out in the kitchen. Dorsi Ramp helps the child reach the worktops. Soon the child will be so engrossed in their cooking they will be unaware of the great stretch that’s going on in their tendons and calf muscles. The Dorsi Ramp provides 10, 15 and 20 degree slope angles. The best advice is to start at the lowest slope angle and work upwards. Always avoid using ramp angles that cause discomfort to the child. Excessive stretching can lead to calf and tendon strains or tears. A child standing on Dorsi Ramp transfers all their weight through their legs and ankles. Experience has shown that greater dorsiflexion is achievable with Dorsi Ramp than through other methods , such as manipulation by hand with the child lying on a couch. If a neutral, or close to neutral, position can be achieved this way then the child will probably be able to cope well with the 10 degree slope. The child should stand on the ramp with their heels close to the lowest corner of the slope. The feet can be pointing directly forward or angled outwards. The compound slope angle will ensure the required level of dorsiflexion in any position with the heel positioned towards the lowest corner of the ramp. The child should be encouraged to stand on the ramp with a straight and upright posture. If the child needs to push their bottom out, raise their heels or shows signs of discomfort then the angle is too high and a lower slope angle should be selected. 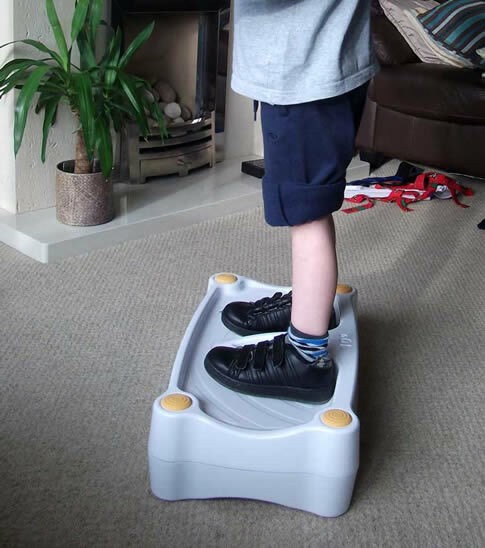 A child will be coping well with the slope angle if they can stand on the Ramp with a good normal looking straight and upright posture for 2 minutes. If the child needs to push their bottom out, raise their heels or shows signs of discomfort then the angle is probably too high. Dorsiflexion is likely to improve with frequent and regular use. When you are certain the child is coping easily with the 10 degree slope then try the 15 degree slope. When increasing the slope angle monitor the child carefully and start with short duration stretches before building up. You may find that children have days or periods when dorsiflexion is relatively good and days or periods when tendons and calf muscles are tight and dorsiflexion limited. This is normal. If at anytime your child is showing signs of not coping with the slope angle then reduce it. Don't despair if you need to regress to a reduced slope angle at any time. Young children often experience growth spurts during which time the tendons take time to catch-up. Just like adults, some days children are less mobile than other. The key to success is regular and frequent use. Children who overpronate or are flatfooted should use Dorsi Ramp with footwear that provides support for the longitudinal foot arch. Ideally such footwear should include custom orthotics. Children who do not overpronate or who tend to supinate (such as children with clubfoot) can use Dorsi Ramp in just socks or bare feet. Shoes, slippers or sandals can always be used if preferred. with custom orthotics to support his heel arch. The sloping surface of the Dorsi Ramp is not flat, but conical. The sloping surface has been engineered such that the prescribed (10, 15 or 20 degrees) dorsiflexion angle is maintained regardless of the position of the foot. The compound slope angle is an important feature because with a flat ramp profile children learn to reduce the stretch by rotating one or two feet outwards. Children tend not to be particularly careful at positioning their feet. 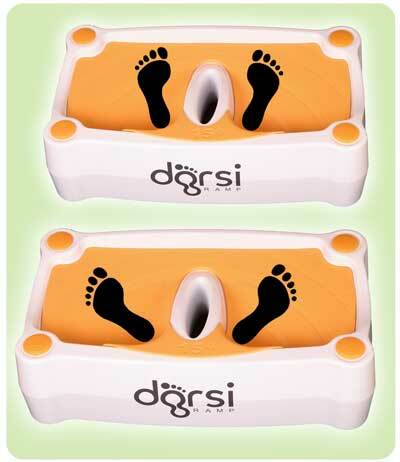 Dorsi Ramp encourages correct foot placement and performs correctly in virtually any foot position. Dorsi Ramp’s ingenious design allows 10˚ 15˚ and 20˚ slope positions to be set without any adjusting or moving parts. This makes the ramp very stable and robust. The Dorsi Ramp has a symmetrical design. To flip between 10 and 20 degree angles simply pick up the ramp and turn it upside down. 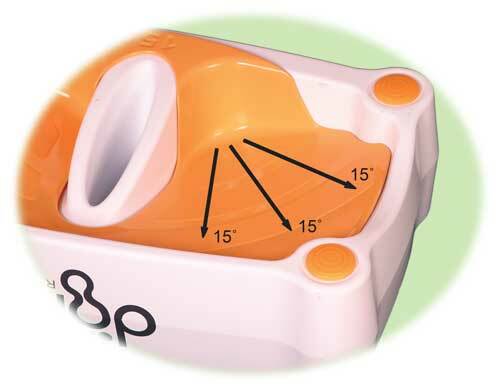 The 15 degree position is achieved by positioning the ramp with the 20 degree slope upwards and placing the orange coloured insert on top. Dorsi Ramp is for use by children up to 10 years of age and a maximum weight of 140 pounds (63.5Kg). Children and adults can usually achieve 20 to 30 degrees of dorsiflexion. This means the foot can rotate upwards at the ankle (tibio talar) joint so that the angle between the leg and surface of the foot is 60 to 70 degrees (ie., 20 to 30 degrees less than the neutral or 90 degree position). Children with limited dorsiflexion might be able to achieve only a few degrees of dorsiflexion or be permanently in plantaflexion. The causes of limited dorsiflexion are too numerous to describe here, but the result is usually a problem with the gait, such as “Toe Walking” and decreased mobility. Sometimes poor dorsiflexion is treated surgically by lengthening the Achilles tendon. The problem is that children’s legs grow so fast that the tendons cannot keep up. Regular physiotherapy is an excellent way of maintaining or improving dorsiflexion in children. But for children physiotherapy can be boring and it is difficult to maintain a regular schedule of therapy. Dorsi Ramp is an excellent way of stretching the calf muscles and Achilles tendons. Because the child is standing their whole body weight is applied to the stretch. A few minutes of good quality stretching each day can make a huge difference and lead to much improved dorsiflexion, mobility and a normal gait. Dorsi Ramp has been specifically designed for children. It is strong and stable and the moulding encourages the feet into the correct position. Dorsi Ramp sessions can readily be incorporated into normal activities, such as teeth cleaning, where the ramp doubles as a step up to the sink. This way at least two good stretches can be achieved each day without fuss or distraction. C-Pro Direct and our suppliers take great care to use only materials suitable for Paediatric Orthopaedic Devices. Whilst we cannot guarantee every patient will no adverse reaction to the materials they come in contact with, we do ensure all materials are sourced responsibly and that appropriate independent test data is available. There is no single technical standard defining suitable materials for a Class 1 paediatric medical device, so we have to draw on a range of standards used in a number of regulated industries including food, toys and clothing. The plastics used are generally recognised as “medical or food grade” materials to FDA or other international standards. Fabrics, foams, dyed materials and other sundry items such as screws and metalwork are tested for toxicity in accordance with a broad range of ISO Standards including ROHS (Restriction of Hazardous Substances Directive 2002/95/EC).